how delicious it has been, lingering among the beauty of the book covers of talwin morris, scottish practitioner of japonisme. he instructs us on the importance of design, insisting upon the sensuous beauty implied within the studies of home, and horse, wordlessly, but with just one look. carpenters are revealed as the noble artists that they truly are by symbol alone. and morris, sometimes, simply creates an added beauty to the already beautiful. With [the Japanese style's] absence of central perspective, along with the expressive linear lines or organic form, the style itself is ideal to apply to a flat surface of book design. Within the composition there can also be cutting of details within the composition and instead of the perspective moving into the the picture space there was a tendency to move up the picture space. These stylistic characteristics can create a flat decorative effect. The sun came out for awhile!!!!!!!!!!! yes--yay! and thanks for that. surprise for you coming soon. Although all these covers are most attractive, it is virtually certain that neither Warners Chase nor Feats on the Fiord are by Talwin Morris: none of the elements - design, lettering, frame - are his. Neither appears in his drawings nor any list of his known works; neither is 'signed' with his monogram or 'morse code' (admittedly, not a pre-requisite. Jack and the Gypsies is a series design acknowledged to be almost certainly by Morris's assistant, Ethel Larcombe. Insofar as Japonism is concerned, Modern House Construction is much more likely to be based on the classical aedicule (Morris was trained as an architect): in addition to a cornice, it appears he even gives us pillars to support an entablature (containing the title). And surely The Modern Carpenter Joiner and Cabinet Maker is proto-modernist in style (see also Modern Power Generators). this is a wonderfully interesting and informative post. thank you for it, and for your visit. everything you say with regards to those items that break with his style become obvious as soon as you say it. what about 'house' and 'horse'? i can't debate you on your comments as to "the classical aedicule" (which i'll have to go look up), however i still see some elements i find it easy to attribute to japanese influence (rampant at that moment). and in fact it's also clear to me that modernism itself finds its roots in this movement as well. The Horse... (1902) is by Morris: it bears his monogram on the front board. One attribution criterion for Morris is that (almost) always nothing on a cover gives an indication of a book's contents. Interestingly, in this case, there is a small exception: there are stylised horses' hooves adjacent to the title. 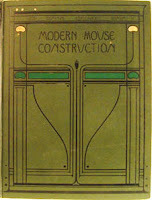 The Book of the Home (1902) is a variant which follows an earlier, different, edition of 1900. The similarities of the swirling grasses and the 'bubbles'of both books here are obvious. These design elements were often used by Morris. They are generally acknowledged to be in the Art Nouveau style; more specifically in the 'Glasgow Style' (seen by many as being the Scottish form of Art Nouveau). Both books are published by Gresham, an imprint of Blackie & Son, Glasgow where Morris was Art Manager from 1893 to 1909)which was formed in 1898. Morris would personally execute all the covers for Gresham during this period. As for Japonisme, you will know that as a style it was seen as exotic and was all the rage in Europe from the mid 19th century, and there will be few artists who were not at least touched by it. And this is true of Glasgow (then Britain's second city) with its port and strong contacts and trading links with the Orient. Certainly from time to time Morris employs the two-dimensional approach; the use of space a la Japonisme; and in his Warwick Library series (Blackie's 1895/1896) the lines are almost like calligraphy. But I do not think it can be said that he was significantly an adherent to, or practitioner of, Japonisme. My view is this. Because the Glasgow style IS now The Four - ask anyone the name of another Glasgow Style artist - and Morris is a Glasgow Style artist, then HIS influences are also now categorised as Japonisme & Symbolism by a sort of uncritical, academic extrapolation. And, for further example, whereas Morris occasionally employs his own symbolism, I challenge anyone to find a Morris design remotely connected to Toorop or Schwarbe. And so, because little is known of Morris each commentator uncritically repeats assertions for which there is little or no evidence. Hopefully something to add to the debate. P.S. In the last sentence of the penultimate paragraph in my last posting I did not mean you. Look at any references to Morris you can find and in most you'll see what I mean. wow john, i'm really glad you found this place! i know it's kind of massive at this point, but if you ever had the chance to go through this whole blog, i think you'd sense that perhaps we're defining japonisme in different ways. i think the influence of the japanese arts and crafts was so prevalent at that moment that it literally changed the way people saw. there was frequently nothing conscious about it. i further believe that everything from arts and crafts to jugendstil to stile floreale to art nouveau to glasgow style to the wiener werkstatte to whatever else those movements that occurred simutaneously in different spots of the world called themselves, they were all were just the different titles and variations of style of each particular culture in it's own interpretation of the break with tradition and the conscious or unconscious influence of the japanese. ie. japonisme by any name would smell as.... well, you know. i have touched on your further mentions; see here and here for example, but know that there're miles to go before i sleep. I just stumbled upon your site. I happen to have the complete set of volumes of The Modern Carpenter and Joiner and Cabinet Maker. In fantastic condition to boot! what a treasure! are the insides as beautiful as the outsides? is it something you can use in your own work? thanks for the note!